For nearly 60 years, Marvin Goldstein hast best been known as an internationally acclaimed concert pianist and composer, but the “Celtic Celebration” concert that Southeast Idahoans will experience at 7:30 p.m. Jan. 26 in the Stephens Performing Arts Center is something entirely different. “This isn’t a piano show,” Goldstein said. But Goldstein is not even the featured artist. For 10 years, Goldstein has collaborated with classically trained vocal performer Vanessa Joy on different musical projects that feature her voice backed by Goldstein on keyboard as well as other instruments. Though acclaimed for his keyboard prowess, something not commonly known among the public is that piano was never Goldstein’s main instrument. Goldstein began his music career at age 9 on the accordion. He attended Tel Aviv University and Florida State University where graduated with bachelor’s and master’s degrees in — not the piano — but the French horn. 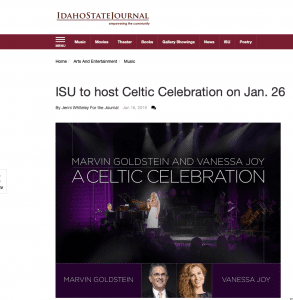 Starting out 10 years ago as a performing duo, Goldstein and Joy have now helped write full orchestral arrangements of their music which will be performed by local talent made up of the Idaho State University orchestra and other community members. Joy earned her vocal music degree from Brigham Young University in Provo, Utah. In 2009, she attended a Music Business Convention in Arizona at which Goldstein was teaching. Up until that time, she had been singing in various community productions, but wanted to take her music to a higher level. She said that it had always been her dream to perform with full orchestra. At the business conference, Goldstein heard Joy sing, got to know her and her dreams, and offered to do an album with her. Both Goldstein and Joy expressed how challenging it is to coordinate a show like theirs with the community members with whom they perform. After ISU asked them to come, orchestra music had to be sent weeks ahead of time for the orchestra to practice. Goldstein and Joy arrive the day before, or even the day of, to rehearse. 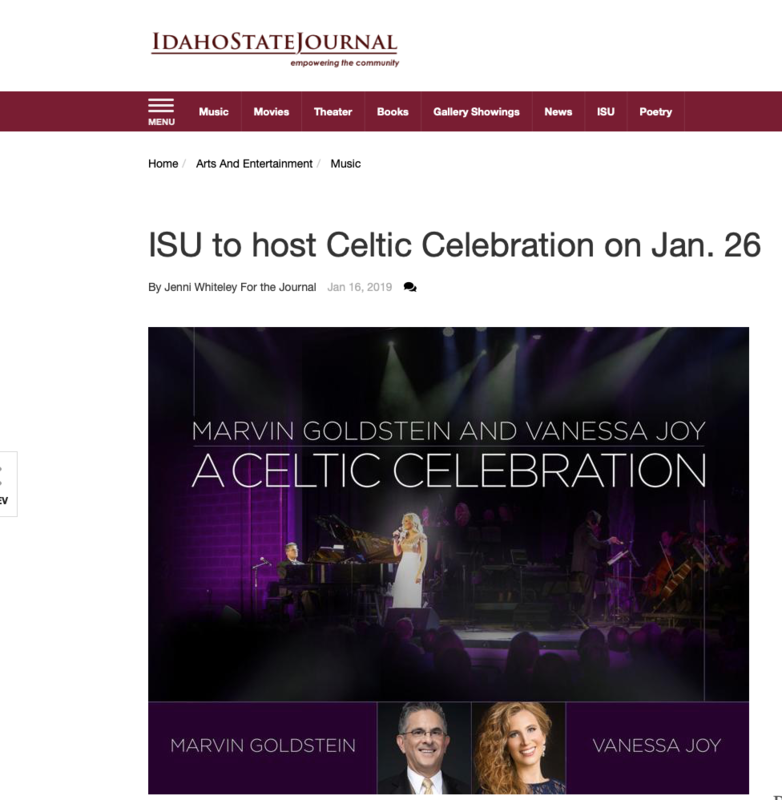 Blending Joy’s operatically trained voice with common American tunes and Celtic layman style is an example of what Goldstein termed “musical fusion.” Joy calls herself a “crossover singer” who can perform vocal music in many different styles — from opera to pop. Since working together as a duo, Goldstein said they have performed in Egypt for the U.S. Ambassador, in South America, Israel, Greece, Turkey, and all over US and Canada. They have also recently published the second album in a series of completely extemporaneous relaxation music. “It was fun to be free and just experiment,” Joy said. “That album kind of sums up one of the main purposes of our association together,” Goldstein said. He believes music has the power to connect and unite people and he runs a non-profit organization called Peace with Music which allows them to bring their music to areas less fortunate areas around the world. Goldstein recalled the joy of playing his accordion every night on the Israeli kibbutzes, or communal farms. Joy stated that music is her way to give back to the world.